As part of the Documentation Beta, we’re going to be doing a series of meta posts (and blog posts in all likelihood) with what we’ve learned, and what we’re planning to change accordingly. See the next post in the series. These posts will normally be about once a week, but since we just launched last Thursday we’ve already got lots to share. Ho-boy, lots of contributions. We got more activity in 1 day on Stack Overflow than we did in the entirety of the private beta. Lots and lots of bugs that didn’t come up in our (months of) private testing. Accordingly, since Thursday we’ve been focused on bugs. Reputation needs work. Adam already posted some tweaks, and we’ll have more in the future. Again we tested in the private beta, and did some additional offline modeling. The basic model (rep for example upvotes, approved changes, and upvoting answers citing docs) doesn’t seem terribly broken - but the limits (like who gets rep for examples, and how much) definitely need work. Expect more reputation tweaks in the coming weeks. There’s a backlog of about 2,000 proposed changes (vs. something like 22,000 total changes reviewed). Some of this is too much content from over-enthusiastic users, some of it is presentation in the UX having too much friction, and some of it is the system limiting trusted users more than it should. There are planned changes below to address this. Some topics have way too many examples. Part of this is because many folks are just trying it out, and adding examples is easy. Part of it is that the “expected number” of examples isn’t well indicated. There’s a planned change below to address this. We will also consider capping examples per topic if this continues to be an issue. We haven’t quite figured out how to allocate numbers of outstanding changes a user should be allowed to have, and number of reviews a user should be allowed to do. For now we have simple daily caps. We’ll keep an eye on rejection rates, and what gets approved, as the “launch bounce” dies down and tweak accordingly. A review queue for Proposed Changes. We were hesitant to do this while Documentation hadn’t been merged into Stack Overflow, and uncertain that such a queue would be necessary. A few days of public beta have shown us otherwise, so this is now on the roadmap. Here’s a (very early, very rough) mockup of the new queue. Tag merges and aliases for Documentation. We will be adding a mapping from related tags to “master” tags (like python-2.7 and python-3.x are related to the “master” python). Such a mapping will migrate existing topics to the master tag and prevent re-opening the aliased tag for Documentation. Initially we (Stack Overflow employees) will be doing these by hand; it may be opened to moderators and high rep users up in the future. A short, optional, “Focus” section at the top of each topic - sort of like what was suggested in this question. This section will be used to define the scope of a Topic and should guide contributors with respect to what sorts of examples belong on a topic. It is explicitly not a summary of the topic, but it will help readers get the gist of what they’ll find. Note: This is now a feature request. If you agree, please upvote! There is an issue right now with incorrect information being added to documentation. Cons: Some users are left out, even if they are just starting on SO and want to contribute. Pros: Any user can propose a change, and users above the minimum tag score can approve it. This solves the con from above. Cons: Tags with not so many users will have proposed changes sitting in the queue for days, waiting for the few people who can to approve the changes. Pros: Tags with not so many users can get still get the changes approved. This solves the con from above. Cons: Those with high reputation but unfamiliar with the topic can still approve changes. Anyone can propose an edit. This allows users to contribute who may be experienced in the topic but haven't contributed on SO proper. At least one person with at least the bronze tag badge has to approve/reject the proposed change before it becomes final. This is to provide accuracy to the docs (slightly changed thanks to @4castle in the comments—see edit history for the previous revision). Change the criteria for a tag to be eligible on documentation from 500 questions to 25 people with at least the bronze tag badge. This prevents dead tags like this, this, or this. See here for the number of bronze tag badges that have been awarded for each tag. Out of the 5 people who commit to the proposal, one must have at least the bronze tag badge. For those that meet the criteria above, do nothing! If it is dead (no one is contributing or 1 person has a bunch of proposed edits that will never be approved), refer here. Otherwise, I currently do not know of a solution (manually look to see if one or two of the reviewers have the bronze tag badge?). Note: Anywhere I said "bronze tag badge" could be replaced with "25 tag score" or "50 tag score". The bronze tag badge is just a reasonable example that SO already implements and records users who have it. I should preface this (somewhat negative, I'm afraid) post with a comment that I've felt uneasy with the Documentation proposal from the outset—though I've hitherto reserved judgment, hoping that my pessimism would ultimately prove unfounded and it would become the "Wikipedia" of technical knowledge. Now seeing it in action, however, I am really very uncomfortable with it indeed. My Q&A contributions to date have primarily been in mysql, whose official reference manual I have always found to be very thorough whilst easy to navigate and comprehend. 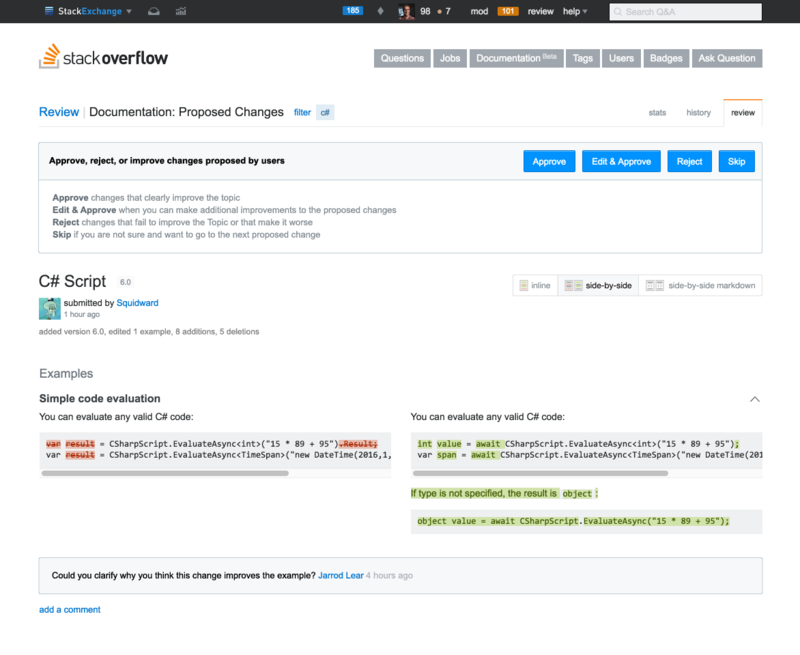 I therefore approached StackOverflow's new MySQL Documentation with some trepidation, fearing it would at best duplicate the official resource or at worst become a disorganised mess of poorly written tutorials that fail to address edge cases. So far, what I see is closer to the latter than the former. Granted, over time the quality of specific topics/examples should improve: but there's so much work to do, and relatively few contributors who write to a satisfactory level of quality, that I fear low quality contributions will (if not have already) become quite overwhelming—much as is already the case with Q&A. Even with sufficient high quality contributors, each tag's documentation would require dedicated curators to maintain consistency and organisation. Indeed, we appear simply to have taken all of the issues that have been raised over quality on StackOverflow and embodied them in something that purports (or at least, strives) to be even more canonical. This is disastrous. The only way that I can see this being (potentially) salvageable is to hugely restrict those who may contribute to Documentation. Unlike Wikipedia (which is generally only edited by people who have "reasonable" subject knowledge) I fear that many StackOverflow users—perhaps programmers in general—either think they understand their subject a lot better than they actually do, or often just post anyway about things they know they don't fully understand (perhaps in some attempt to win more magical unicorn points). I certainly wouldn't pretend that I've never fallen into one, or both, of those categories myself. I don't even think editing Documentation is a privilege that should be linked to SO reputation, which is ostensibly a measure of one's problem solving abilities—after all, good technical writing is a skill that does not necessarily bear much correlation to diagnostic skills. I suspect it should perhaps be awarded more manually, based on the quality and detail of one's posts. Apologies again for this (not very constructive?) rant—I just feel so much effort has already been (and is still to be) expended on this project, and I'm skeptical it's adding any value, that I think it urgently requires deeper thought before it's allowed to progress further. I'm inclined to suggest that the public beta should be suspended until these problems are addressed. This is pretty great. A tight feedback loop and lots of transparency is always good to see. I think that the next most important topic after the massive queues is the fairly illogical ordering of the topics on documentation. I can't pick a topic and start learning it, which I think is a great measure of success for the documentation project. It is terribly broken. There are plenty of examples about why it's completely broken. It's not just a matter of threshold configuration or whatever you call it. Can we please introduce more reputation limits for examples on Documentation? I would expect a complete reworking, not just some tweaks. That quote is missing the context of "but the limits (like who gets rep for examples, and how much) definitely need work." It's not a matter of limits, or thresholds. It's basically how the rep model is designed. See the links I provided. I think that the cheap reputation influx from Documentation may actually have a tangible adverse effect on the participation in the Q&A section of the site, since it disincentivizes users from investing time into actually helping people, when right next door they can make ridiculous amounts of reputation by changing "do not" to "don't", making a Hello World program du jour have proper brackets placement for the language in question and copy-pasting text and source code verbatim from corresponding technology's own documentation. Call me a rep whore, overcome with green mouth-foaming envy (and you would be absolutely right in this assessment), but I feel utterly disheartened by Docs giving out thousands of rep to users in several days for contributions as valuable and expertise-demanding as I've just described, when achieving comparable results on the Q&A would take months of actual effort and even, occasionally, a shred of expertise. Now, I realise that there are low-hanging fruit questions asked every day, which require no effort either. Indeed, my own most upvoted answer is the one stating that private instance variables are accessible from other instances of the same class (some revelatory stuff!). However, most of them get promptly closed as duplicates, since there are only so many basic concepts to clear up in each topic, while others get a few smug comments, a few obvious answers from desperate users with below 1K rep (such as myself) and, crucially, get washed down the ever-flowing stream of history, never to be seen by a potential upvoter again, instead of being nailed to the top of the entire site section, getting constant drops of basically free reputation forever. So, in short, I don't think that psychological effects of having Docs reputation contribute to the same pool as the Q&A have been great so far and I don't see the situation being improved just by "tweaking" the existing system. I think Documentation should be purely altruistic, for its own quality's sake, or at least that rep pools should be separated. A lot of contributions I'm seeing are more like, "here's some example code with no explanation of how it works". That's not documentation, that's not even acceptable in an SO answer. When I click on "Proposed changes > Reject", one of the reasons should be "needs more details" or I should be able to link to an existing, more complete entry (if one exists), as is possible with the "dismiss topic" link. I think it should also be possible to move topics from one tag to another, if they are requested/created in the wrong tag. The biggest problem I see so far with documentation is plagiarism. People are copying and pasting from official documentation without even adding any commentary or usage guidelines, which adds no value and is of questionable legality. Sometimes they'll add a link back, but when 99% of the content on your page is copied from an external source I don't think you can claim fair use. Could we restrict topic creation? some kind of minimal rep? approval required by multiple people (with enough reps)? About the tag part, I don't exactly understand how they work. See this basic example: Hello World... There is one topic in the .NET tag that gives examples on how to do it in several languages: C#, F#, VB.NET and C++/CLI. Then there is this topic, in th VB.NET Language tag, that explains how to build Hello World in VB.NET. I think that there should be a difference between an actual programming language and a library that can be used on many languages. Thanks for the update! Weekly updates are a great idea, especially in the beginning now. I perhaps would not put everything in this queue. The tags where there are enough contributors, especially with enough people having the necessary domain knowledge, work fine currently. It is easy, as someone with not so much domain knowledge about a specific topic to accidentally approve something factually wrong. Currently, I'm regularly checking through the list of already approved proposals to spot whether the approvals were fine... They really aren't always. It is already bad enough [I've had everyday seen 1-2 factually wrong proposals which got approved]. I cannot imagine a general purpose review queue improving this situation. See also: What can we do about robo-reviewing on documentation? Thus, I'd suggest that the review queue to be used mainly for low-frequency tags where the time until approval is exceeding 12-24 hours. As it is really valuable to have the proposals reviewed by domain experts. Just in case there are none, it must go through the generic queue. Alternatively, you can have the queue by default only for low-frequency tags and allow people to opt-in for other tags (if they are knowledgeable there). Reviewing well-frequented tags [where enough reviewers exist] should definitely not be a low hanging fruit. They are nice to have, and I can just think of a few issues in case a tag needs to be split up (some topics belong more to one tag, and some more to the other one), or only parts of a tag needing to be split out. This should be taken into consideration. I am not sure if I understand the overall reason for the Documentation site; I mean, it seems very structured and formatted as if there is only one way to write documentation. I understand the need for more examples, but a lot of good documentation is prose. Why, after I click on the DocumentationBeta link, and then click on Questions, does it take me to the recents tab? I thought it would take me the Home tab. Next, Click on Questions (on the top of the site, to the left of the Jobs link). Result: You are taken to the main StackOverflow page, with the "recents" tab selected. Expected: You are taken to the main StackOverflow page, with the "home" tab selected. Is there a way to allow monospaced text, without the grey background? This is useful in tables when defining parameter values. Speaking of the Parameters section, why can't I write normal text in it? Sometimes, a parameter requires a footnote or other explanation that is out of place in a table. However, when I tried to do this it gave me a "can only contain two column table" error. Why this specific restriction? With regard to the problem of too many examples per topic - I think this comes back to the structure of documentation and the two ways that this allows it to be used. As a book - i.e. a topic is a chapter. Thus a "String Manipulation" topic will have lots of examples for how to perform the multiple ways of manipulating strings (creation, concatenation, copying, searching, splitting, length-counting, character and sub-string replacement, etc) in different contexts and use-cases (At definition time, statically allocated strings, dynamically allocated strings, best practice vs low-memory environments, etc). As a reference - i.e. a topic is based around one single facet. Thus a single topic could be "String Concatenation" and then provide documentation for the basic string concatenation function of a language covering only the common, basic, use-cases. Other string concatenation functions or use cases would be covered in more specifically named topics. Here is the issue. Documentation is structured for the latter (a topic name, a small number examples, a syntax section [itself implying application to a single code operation], and the remarks section being towards the end rather than the start), but is used for the former (titles over concepts rather than specifics, remarks section used as topic descriptions rather than short, well, remarks, syntax sections being over-run with attempts to document syntax for all the items documented within a chapter topic). Personally I feel that the current usage we see is actually producing a more helpful Documentation than a reference style. But it does not suit the current structure. The resulting conclusion being that the structure of Documentation needs rejigging to better match the reality of its use.